Social Media has taken over our lives, at least a Blogger's life. There are endless chores, and competition for one to race-onto-the-internet and be liked, be followed, and be added to others' circles. When I think about how much time Social Media took from the precious hours of our lives, it is quite scary. Yet, on the positive note, because of Social Media, many jobs have been created for artists and talented individuals. 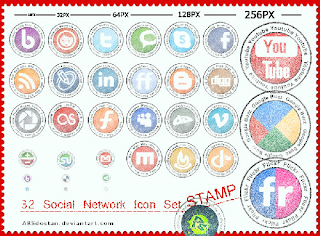 There are Social Media Icon designers, Social Media Consultants, and Social Media pushers- those who primarily specialize in building the numbers of likes, followers, ecetera. 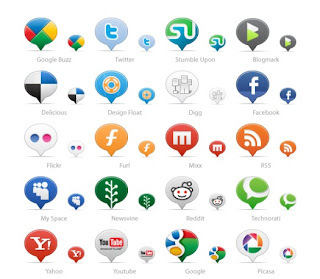 Social Media is such a huge phenomenon and plays abig part in our lives that you cannot go anywhere and not see the Social Media Icon sets or hear these two words. I especially support Social Media in the way that it has provided many people with jobs and created opportunities for those who might not have had jobs if Social Media wasn't around. God bless America and the Internet for both have brought equal opportunities to those who are willing to work hard and is open to put in sweat and talent.< I browse for new Social Media Icon sets now and then and when I do, there are many that I like, but can't use them all on my blog. 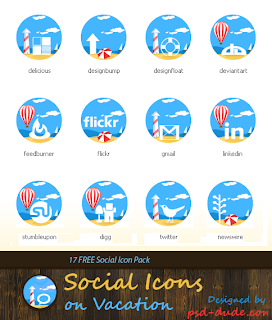 I have to go with my theme, so I am sharing the 10 Free Best Social Media Icon Sets with you, perhaps you might be able to use one of these on your blog. 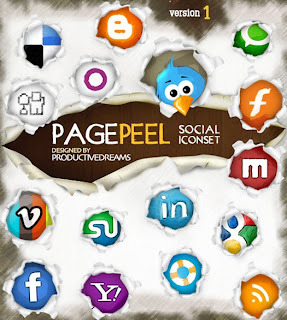 Just click on the images, they will take you to the pages that you can download them directly. Actually there are 11 sets here, but who's counting. Enjoy! That's an incredible collection of icons. I'm slowly wrapping my mind around this phenomenon! i am ignorant to this, i blog, but then, i do not really spend so much time on blogging. Time is against everyone, it is the maintenance and the building that we all don't have time for. Thanks Tara. Self Sagacity could still use a lot of TLC. They are one of my favorites. Such creativity - these artists have, huh? Pretty cool. How would you use them? I couldn't use them on everything, or my blogs. I have a theme, unless I change my theme, I really can't use any of them. 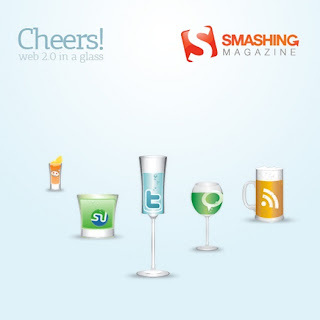 Thanks for sharing - it took me quite awhile to find the perfect set of icons for my site! I have tried all of them and then I decided to keep the original buttons for the sharing option and hide it in the second layer just below the posts. Now I am rethinking should I make my own icon set or just use the listed ones. 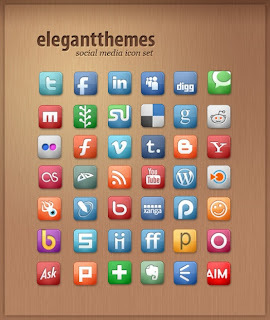 A set with the summer theme looks great, but you can use ( or make) icon sets depending on your blog's topic/s. I will still prefer to use hand made. I also saw that some blogs use crafted ( wood) or knitted social icons. 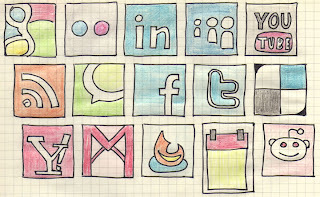 I would use the Hand Drawn Social Media Icons as a template and draw my own. 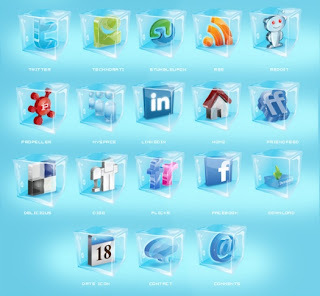 In that way I would have the most original set of the icons. At least, that is my opinion about it.